Graphic, lightweight and fluid, Zinta is a modular sofa system defined by the harmonious juxtaposition of smooth lines and warm materials. Its deep seat perfectly supports the casual recline of the body. Its system of variable lengths and gentle angles allows it to weave through a space with subtle dexterity. 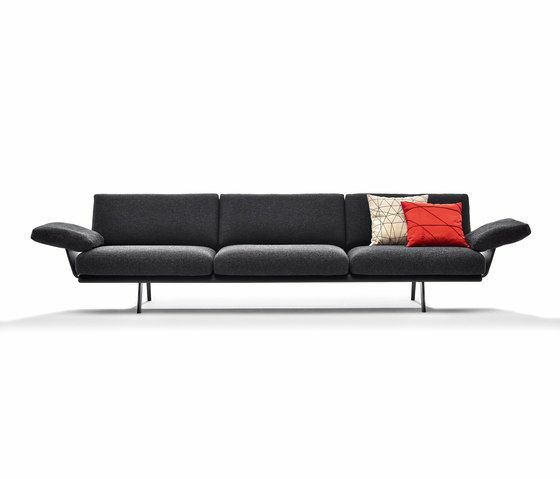 It can serve as simple, single sofa or large-scale organizing principle in an open space. With a range of cushion options with diverse materials and fillings, it can serve a range of environments from residential to restaurant, lounge to office with equal ease. Zinta is comprised of wood shell lined in pads for contract or cushions for a more accommodating seat in a select group of fabrics. Diverse sizes, materials and fill allow for diverse combinations and applications. Shells are available in wood veneer in natural, brown and dark oak. Still base and aluminium legs are painted in dark grey color. Optional plywood armrests are available. Diverse lengths and angles allow for endless combinations.